Farms and ranches are home to many things that are beneficial to both children and adults (plants, animals, family, chores, business features, etc.). Many adults who grew up on farms are happy to talk about the benefits of being raised on a farm – from instilling a good work ethic and teaching responsibility to building character and a passion, love and respect for the land. However, youth doing work that doesn’t match their developmental level and abilities increases the risk of injury. Children, teens, and adults working on farms face hazards not encountered in other jobs. Use these guidelines to help determine if a youth is ready to perform a job and learn about hazards and keeping working youth safe. 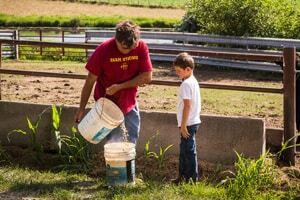 Are youth assigned farm tasks or chores appropriate for their age and ability? When a youth is working, is an adult providing adequate supervision, based on the youth’s age/ability and the task? Does an adult train youth on how to do a task safely and demonstrate the task before having them attempt it? Do youth demonstrate safely performing a task 4-5 times before they are allowed to perform the task on their own? Are youth encouraged to ask questions when unsure about how to perform a task or address a hazard? Does an adult check the work area, ensuring it is free from as many hazards as possible, and educate youth how to avoid/address any remaining hazards? Do youth wear appropriate personal protective equipment (gloves, hearing protection, etc.) when working? These are just a sample of the items on the checklist. Click the download button below for the full checklist. Disclaimer: The facts and information listed above are suggestions for your safety, but are in no way a comprehensive and exhaustive list of all actions needed to ensure your safety.